Somehow I forgot to post Joe Simon’s 96th birthday yesterday. I did not forget his birthday as I visited him Saturday. But Joe downplays his birthdays and does not want to make a big deal about it. He is in good health and still rather active. He is scheduled to appear at the Wizard’s Big Apple Con on Friday, health permitting. No mention of time. Joe rarely makes convention appearances and when he does they generally are rather short. Not so much because he gets tired but rather because he gets bored. So if you go to the Big Apple Con keep and eye out for him. 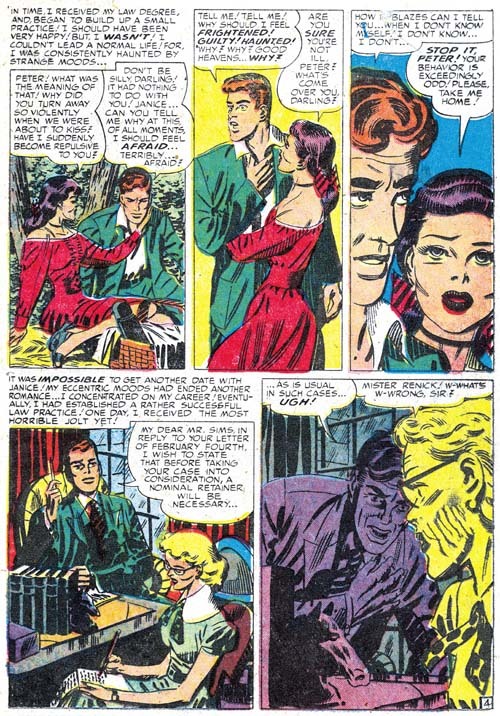 As in Chapter 19 of The Art of Romance, Mort Meskin was the most productive artist for Black Magic drawing a total of 30 pages. Bill Draut was particularly active and draw 21 pages. The third and fourth places was held by an artists new to the studio; Bill Walton with 14 pages and Bob McCarty(?) with 10. Jack Kirby takes a surprising fifth place having provided only 9 pages. Kirby was the only artist who drew covers for Black Magic so three of those pages were covers with the remaining 6 pages from a single story. However we shall see Jack had a hand in other aspects of the title. Still it is a continuing mystery why Kirby, renown for his fast drawing, was so unproductive lately and especially during the period covered in this chapter. The rest of the art was provided by three artists each providing a single piece; George Roussos (4 pages), Al Eadeh(?) (2 pages) and 3 pages by an unidentified artist who used J. G. as initials. Unfortunately John Prentice does not appear in any of the Black Magic issues covered in this chapter. 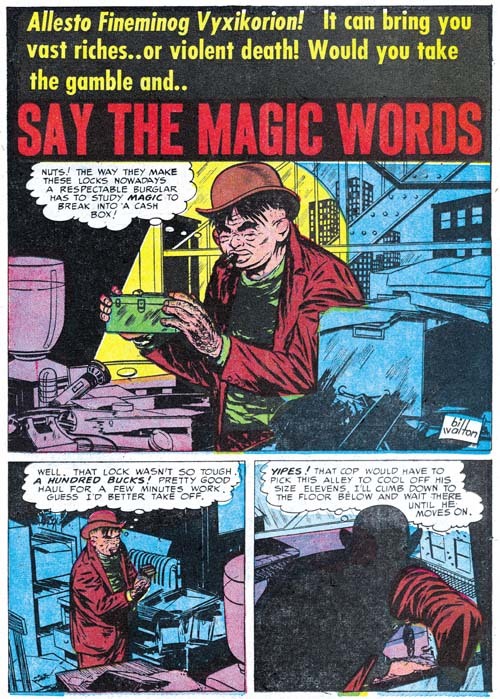 Simon and Kirby did not use Prentice in Black Magic as much as some of the other studio artists. This certainly was not because Prentice was poor at the horror genre. Not only do I think he did a good job in Black Magic but he was clearly better than some of the artists that were used. I suspect the bias had more to do with how well Prentice did in the love titles that S&K preferred to assign him romance work. I always want to include at least one Kirby story in all my serial posts, but this time there is only one to choose from. Still it is a great story and was recently included in Titan’s “Best of Simon and Kirby”. Of course picking the best from Simon and Kirby’s repertoire is always a difficult decision since they did so much great stuff in all genres. I am sure I have said this before, but George Roussos is not among my favorite Simon and Kirby studio artists. His artwork is a bit too crude for my tastes. 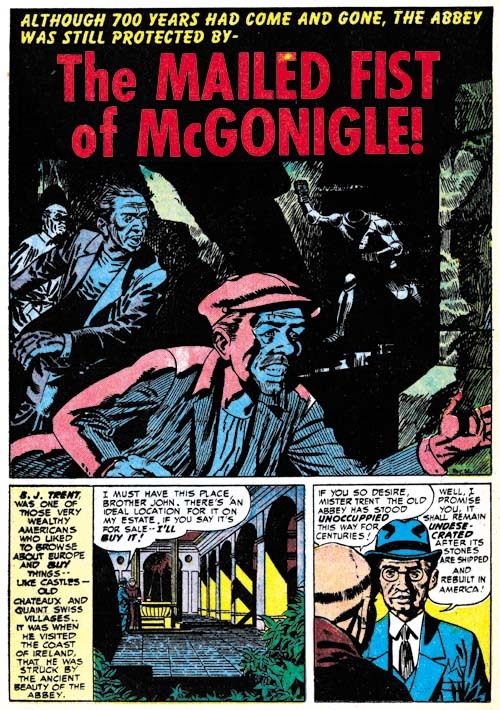 With that said I often find his use of blacks very interesting especially when he uses them in a splash such as in Black Magic #14 (July 1952) “The Mailed Fist of McGonigle”. Perhaps the greatest weakness in this particular splash is that it is easy to overlook the running figure in the background as an empty suite of armor. When I wrote Chapter 19 of the Art of Romance there was one story whose artist I could not identified but felt looked very familiar. Had I reviewed the work in this chapter of the Little Shop of Horrors I would have been known immediately who it was since both Black Magic stories by Bill Walton are signed. Fortunately all was not lost as sharp eyed Ger Apeldoorn recognized the correct attribution right away. Bill has a tendency to shorten the height of his faces and in his three quarter views to place the eyes at an angle. Walton will be making regular appearances in Simon and Kirby productions for a while so there will be amply opportunities to see examples of this work. 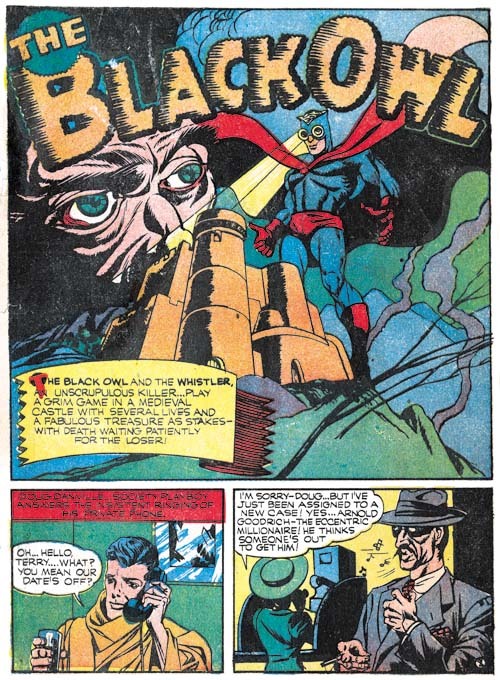 The June issue of Black Magic provides the first appearance of another artist that will regularly show up in Simon and Kirby productions for a time. The problem is he never signs his work and the only reason I have questionably attribute the art to Bob McCarty is because of some similarities to that artist works from 1954 (McCarty also did not sign his work but Foxhole was the only Simon and Kirby comic that provides some of the credits). However there are some differences between the art that might mean that they were not done by the same artist or that his art had evolved. One of the most distinctive features of the art in “Where is Alfred Weeks” as compared to McCarty’s art in Foxhole is the use of oversized eyes (not particularly obvious in the image I supply above). I will continue to questionably attribute this work to McCarty but I hope that I will resolve this issue, at least to my own satisfaction, as I proceed with these serial posts. Black Magic #13 (June 1952) “The Handwriting on the Wall”, art by J. G.
“The Handwriting on the Wall” is an unsigned piece but there are some similarities to a story from Black Magic issue Black Magic #9 (“The Man in the Judge’s Chair”) that signed “J. G.”. One story, “Visions Of Nostradamus”, is by an artist that I originally thought might be Al Eadeh but I have not yet done my homework and found a contemporary signed piece by the artist to resolve the issue so I will continue to use a question mark. Ger Apeldoorn, who is much more familiar with Atlas where Eadeh also worked, seems more confident about the attribution. Eadeh(?) is a competent artist but nothing in his work that I have seen suggest the artistic talent shown in the splash. Of course that is not an acceptable reason to question whether he drew the splash (even poorer artists sometimes create a masterpiece) but the brushwork does not look like his either but does look like inking by Jack Kirby. 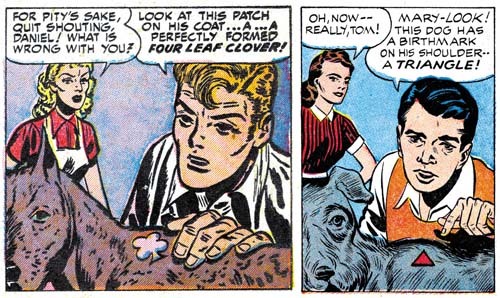 The rather oversize eyes might seem incongruous for Kirby but similarly sized eyes appeared in a Kirby splash from Young Love #25 (September 1951, Chapter 16 of the Art of Romance). Mort Meskin’s style is very different from Kirby’s and normally there is no problem in distinguishing the two. 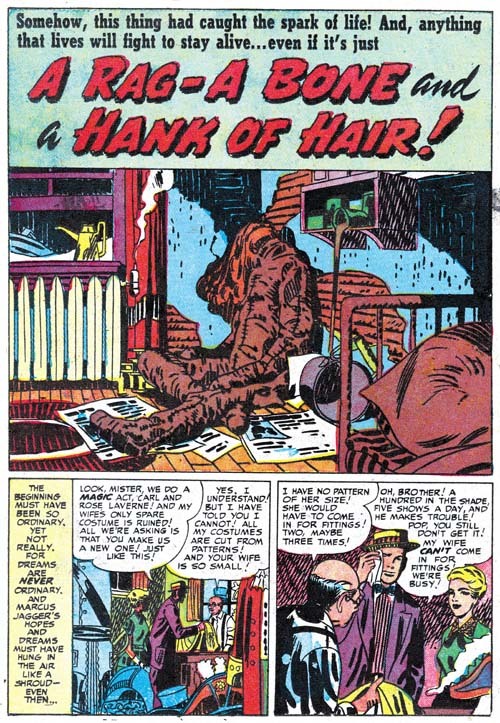 The story for “A Rag, A Bone And A Hank Of Hair” is obviously penciled and inked by Mort and in the past I assumed he did the splash as well. But since there are no figures in the splash, or at least human figures, this was really nothing more than an assumption. But during my review for this post I noticed the arcing of the two shadows on the wall. These are not true abstract arches but they still are a typical feature of the Studio Style inking. Now Meskin was excellent at Studio Style inking but he used that approach when inking Kirby’s pencils and generally not when inking his own work. Then I notice the inking of the oversized rag doll. The brushwork on the dummy is done with a rather blunt brush that is more typical of Kirby than Meskin. There is also a brush technique that I have not discussed before nor included in my Inking Glossary but nonetheless is an often found method used by Kirby (perhaps Joe Simon as well). Notice the simple hatching found on the lower part of the dummy’s arm (somewhat obscured by a white piece of paper). They form a shadow that is a sequence of arcs; what I think of as a scalloped edge shadow. Much of the brushwork in the splash has the sort of loose control that Kirby was so great with, but not all of the inking. 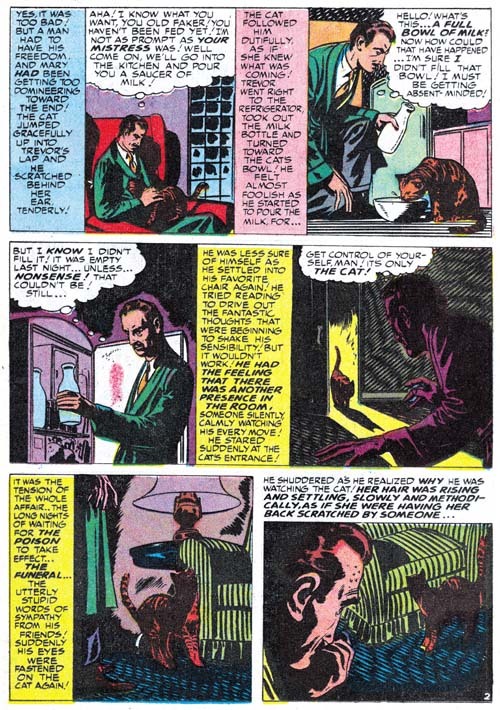 The crosshatching on the cupboard is more mechanically arranged than typical of Jack but often found in Mort’s inking as can be seen in the two story panels on the bottom of the page. Also the inking of the pillow in the foreground looks more typical of Meskin particularly where closely spaced nearly parallel brushstrokes are used. I include a story page as well so Meskin’s method of inking the large rag doll can be seen as well. Notice the brushwork is not as blunt, there are more uses of parallel ink lines, and there are no scalloped edge shadows. Even the hair is inked rather differently than Jack’s splash. The reader might have noticed that while I have recognized Kirby’s inking, I have not said anything about the drawing. 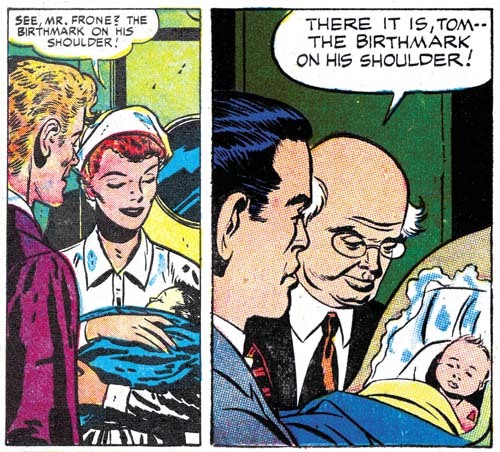 Unfortunately there is little to go on as the dummy is drawn in the same manner in the splash and the story. 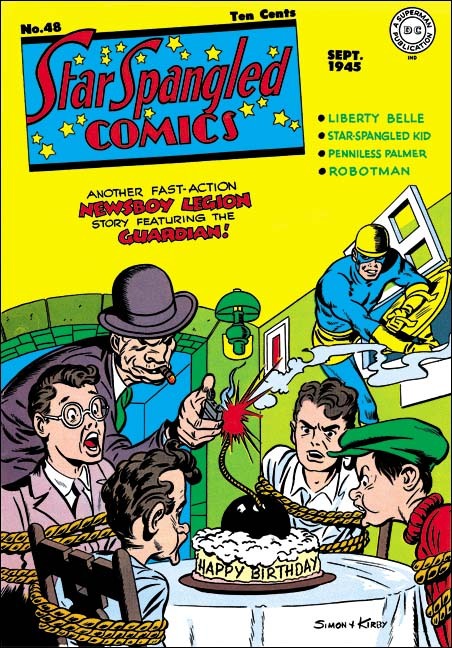 This might suggest that Meskin drew both but the cover is also based on this story and provides a similarly drawn dummy and there is no question that Kirby drew the cover. The only thing I can point out about the splash is the use of perspective; somehow it seems more consistent with Jack’s work than Mort’s. I fully realize that this is a very vague and subjective description but it is all I have to offer at this time. I do not know if I have convinced anyone else, but I have convinced myself that Jack was largely responsible for the splash panel. Kirby drawn splashes in stories otherwise drawn by other artists are not the norm but are not that unusual either. They are rare enough that I can include all the cases I find in my serial posts. But Kirby splashes are common enough that many chapters (but not all) have examples. 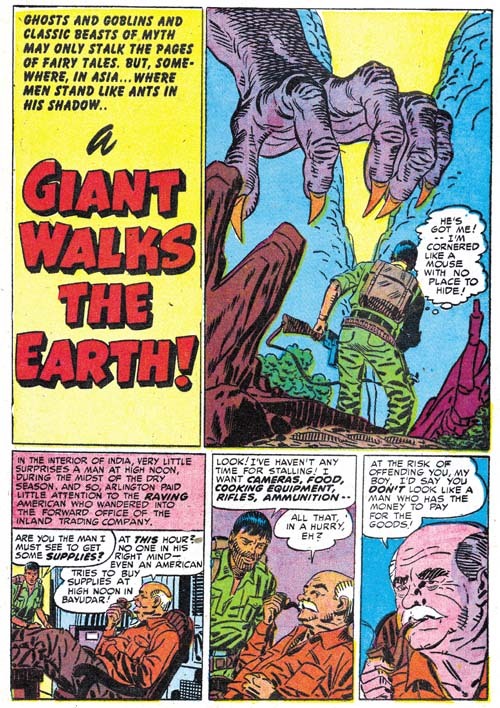 However it seems out of the ordinary to find so many Kirby splashes in just three issues because “A Giant Walks the Earth” appears to be another case. Again Kirby’s hand is easiest to spot in the inking. The folds on the human’s pants are typical of Jack’s brushwork; they have simple abstract shapes with no signs of the brush tip. The inking on the giant hand is done with a blunt brush more typical of Jack’s than it is of Mort’s inking. There is crosshatching on the giants forearm but note how less mechanical it is compared to the examples found in “A Rag, a Bone and a Hank of Hair”. However the inking of the foreground rocks all looks like it was done by Meskin. In fact there are some rocks in the story that are inking exactly the same manner. Mort also clearly inked the story panels of the first page. This provides a good comparison of the two artist’s approach to inking cloth folds. At a glance they may appear the same but instead of the almost puddle like look found in Kirby’s inking, Meskin constructs folds using parallel lines with no attempt to hide the tip of the brush. Even though Mort is clearly inking the story panels on the splash page the art does not look like his. I provide an image of the second page so that two can be compared. The difference between the two is most obvious in the older man. So if Meskin did not draw the story panels from the first page, who did? I believe Kirby drew these as well. The end result may not look like typical Kirby art because Meskin appears to have inked them with a heavy hand. Normally Mort was quite a good inker of Kirby’s pencils and not so heavy handed but I believe in this case Mort purposely inked the first story panels this way so that they would blend better with the rest of the story. One of Bill Draut’s contributions was “When I Live Again”. Bill does his usual competent job but to be honest I doubt that I would have mentioned it because there is nothing truly unique about it. However when I reviewed I quickly realized that the plot was very familiar. So much so that I did some searching and sure enough found a similar story in Alarming Tales #1 (September 1957, “Logan’s Life”). It is more than similar stories; they were the same plot only the six pages of “When I Live Again” had been reduced to a mere two for “Logan’s Life”. According to every source I have ever seen the art for “Logan’s Life” has always unquestionably been attributed to Jack Kirby. The text was re-written but the art for the story in AT #1 has clearly been swiped from Draut’s from BM #13. Of course the art was not a close copy; no one is likely to mistake the AT #1 story as done by Draut. But most of the panels in the AT #1 story were obviously based on panels for BM #13. In fact every panel in “Logan’s Life” from AT #1 was based on one from BM #13 although as can be seen in the above images it is not always so obvious since not only has the panel been recomposed but the people portrayed are sometimes changed as well. 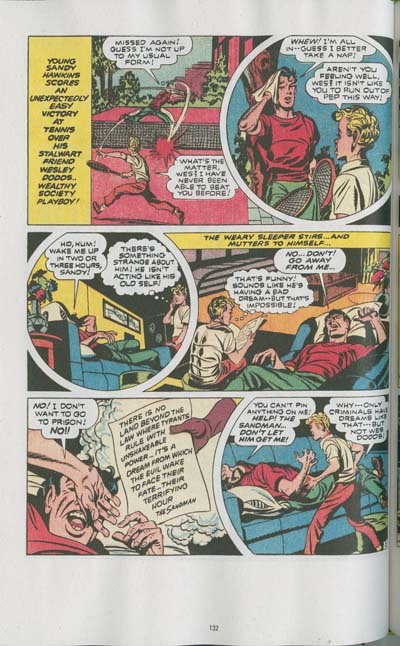 These changes might seem superfluous but in fact the in each case the alterations made the alterations the particular panel from Draut’s layout to one like Kirby would use. In the end entire story is a convincing example of Kirby’s art. Of course it must have been convincing because as I said in the past everybody has credit Kirby with the pencils to his story. 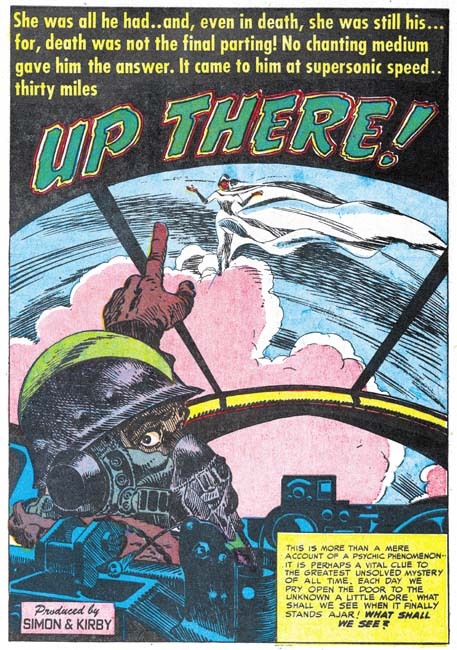 Last week I wrote about the Red Raven cover and the Hal Foster panel it was swiped from. I have since searched through all my sources and it would seem that most who were unaware of the swipe attributed the cover to Kirby alone while all those who knew of the swipe credited to Joe Simon either alone or in combination with Jack. (There were a few who gave joint credits to all the art by Simon and Kirby.) I still attribute the Red Raven cover to Jack but in the case of “Logan’s Life” I have changed my mind and now believe it is by Simon. I had detected Joe’s hand in this story but I had previously decided it was due to the Simon being the inker. Now I realize he penciled “Logan’s Life” as well. I base this conclusion not on the fact that the story was swiped but because the similarity to another story Joe swiped for Fighting American (Jumping the Shark). 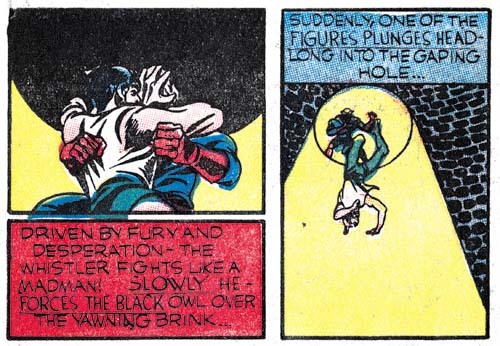 The Fighting American story was swiped from a Kirby drawn Manhunter story so it may not be surprising that everybody had previously attributed it to Jack. 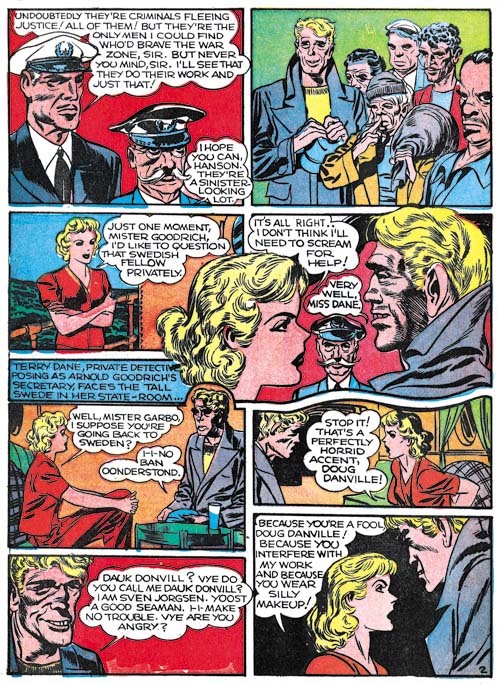 But the source for “Logan’s Life” was by Draut and this shows how convincing a job Joe could do at mimicking Jack. Something that should always be kept in mind when trying to determine attributions for work by Simon and Kirby. Joe Simon gave me a copy of DC’s new book “The Sandman by Joe Simon and Jack Kirby”. Amazon lists the release date as August 18, but it may be in comic books stores sooner then that. Simon and Kirby worked on Sandman (along with Manhunter, the Newsboy Legion, and Boy Commandos) just after leaving their highly successful run of Captain America at Timely. 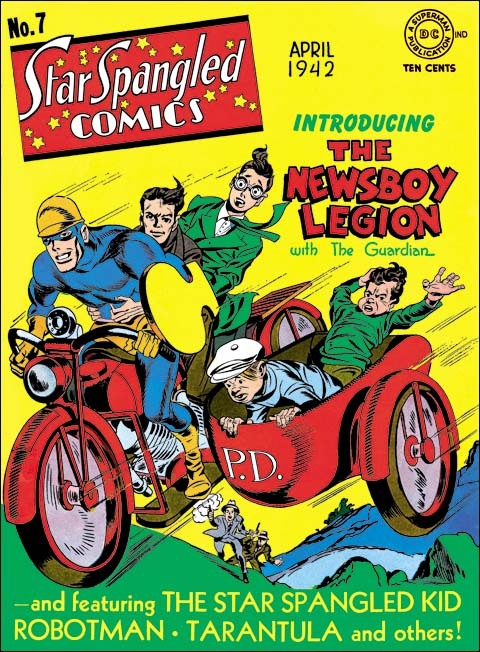 It was with Captain America that Simon and Kirby achieved fame but it was at DC that their unique collaboration really took root. This book provides all the Simon and Kirby Sandman stories that appeared in Adventure and World Finest Comics. That means the book contains all the independent Sandman stories that Joe and Jack did but excludes Sandman’s appearance in All Star Comics as part of the Justice Society of America. The Sandman also excludes some Sandman stories done by other artists while Simon and Kirby were doing their military service during the war. Included also is Simon and Kirby’s last comic book collaboration, a remade Sandman from 1974. Only the first issue of the 70’s Sandman is here since Joe and Jack once again went their separate ways. With 290 pages of art that is a lot of Simon and Kirby and at $39.99 a real steal. At that price you could not even buy a single issue of the original comic let alone the entire run. There are two basic philosophies about how to reprint old comic book art. One approach is to recreate, or as Marvel calls terms it reconstruct, the art. The other approach is to use cleaned up scans. Recreated reprints can look superficially attractive but the reader is actually getting a modern artist interpretation of the original work. Depending on the artist doing the recreation this may or may not be very accurate. 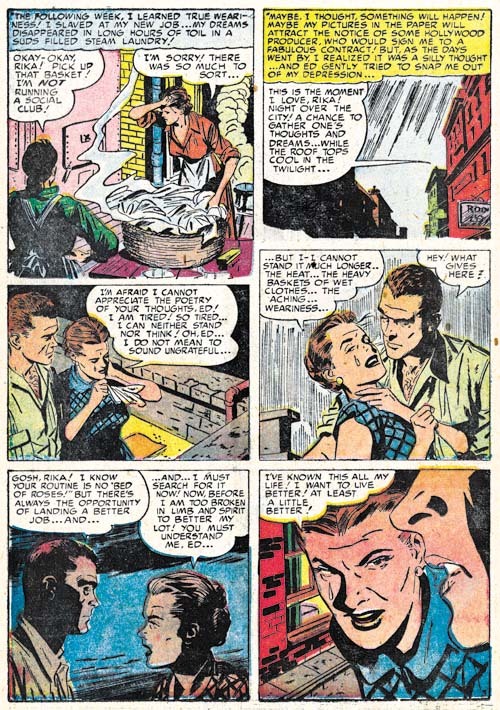 Reprints using scans are accurate but not always pretty because of the primitive printing of the original comics and the deteriorations that they have suffered with age. I prefer reprints that use scans and I am happy to say that is the approach that DC has adopted for this volume. In all honesty there are some problems with The Sandman. The book is 7 by 10.5 inches in size. This is a common dimension for books of this nature but it meant that the art had to be reduced in size. However it is not much smaller then the original and reading is not really impaired. I would have preferred the original size but that would have meant a larger book with a correspondingly higher sales price. It is not the height of the original comics that caused the difficulty but rather the width. DC was obviously trying to limit the amount of size reduction and so the margins and gutters are rather narrow. The image above shows the resulting page format. The narrow gutter does not really affect the reading but as can be seen it does make scanning difficult. There is a nice introduction by John Morrow, publisher of The Jack Kirby Collector. Morrow provides some much needed background for those not steeped into the history of Simon and Kirby. 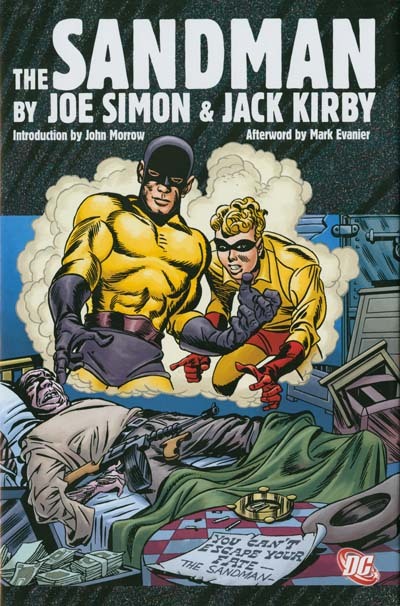 However there is a secret rule that says that every volume reprinting Jack Kirby material must include an essay by Mark Evanier, in this case it is an afterword. Of course I am being a little bit facetious about there being such a rule, but only a little bit. Evanier not only knows more about Jack Kirby then anyone else but he is also a marvelous writer. His presence in The Sandman, or any other Kirby volume, is always much appreciated. What can I say, this is after all the Simon and Kirby Blog and this book is prime Simon and Kirby. Buy this book to find out how a second rate backup feature became the star of Adventure Comics. Buy this book to see how exciting Simon and Kirby could be. But buy this book. 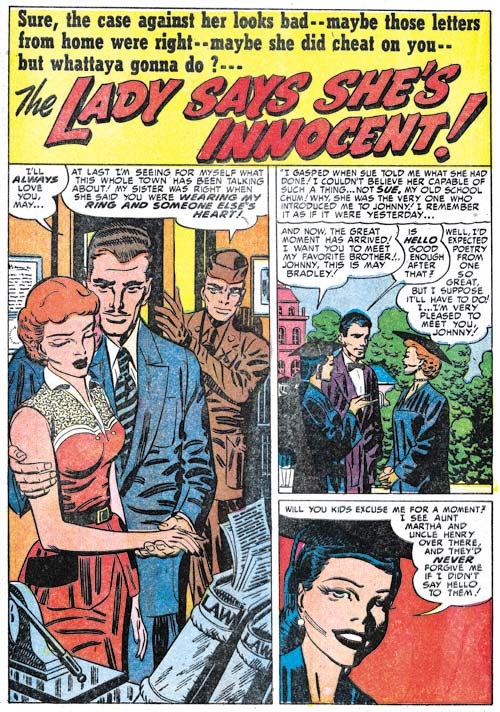 There has not been much change in what the Simon and Kirby studio was producing which were two monthly romance titles and one bimonthly horror all for Prize Comics. I believe all three titles were doing well but I will leave off explaining what is behind my belief until Chapter 20 of The Art of Romance and Chapter 4 of The Little Shop of Horrors. Mort Meskin provided an astonishing 105 pages of art for the period covered in this chapter. This was much more then what Kirby drew (37 pages). To provide perspective Kirby only drew one more page then Bill Draut (36 pages) an artists not known for his speed. At this point Meskin has been the primary romance artist for about a year. You have to go back 3 years to find a period when Kirby produced more pages then Meskin did in these three months. The pool of other studio artists used during this period is rather small; John Prentice (27 pages), George Roussos (13 pages) and an unidentified artist (6 pages). Kirby was the artists for the lead story for YR #42, #43 and #44 as well as YL #31. He continues to use the confessional splash where someone introduces the story to the reader and their speech balloon is also the title. The splash for “Forget Me Not” is perhaps the best of the Kirby splashes for this chapter. Kirby has been known to provide a splash page for a story otherwise drawn by another artist. But it is unusual to find another artist doing the splash for a Kirby story. I find it particularly surprising that the artist would be George Roussos. The “Problem Clinic” is a standard Nancy Hale feature but this particular one is different from the others. The large vertical splash is not found in other Nancy Hale and is also not a typical splash format for Kirby. Normally “Problem Clinic” starts with Nancy Hale introducing the story, but not in this case. All this makes me suspect that the story was not originally meant to be a Nancy Hale “Problem Clinic” but was re-edited to become one. 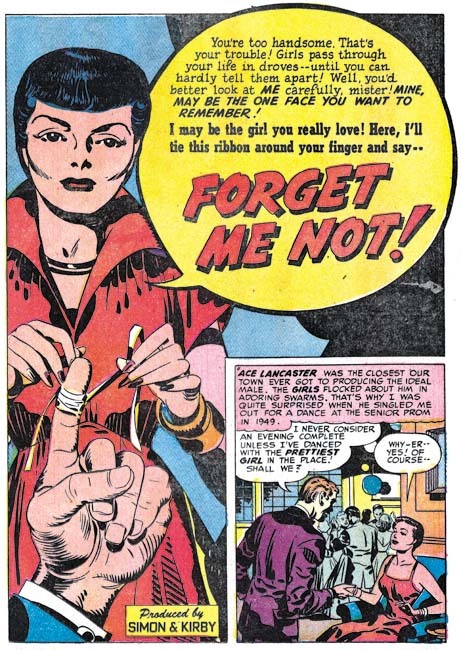 While I commonly find phrases in romance stories drawn by Jack Kirby that suggest that he was at least modifying the scripts I normally do not find such phrases in the work of other studio artists. This not to say that Jack did not contribute to the writing of stories for other artists, some writers have reported that Kirby would help provide the writers with plots. But Jack did not seem to re-write the scripts the writers returned unless he was going to draw the story. However the splash for “The Lady Says She’s Innocent” might be an exception. 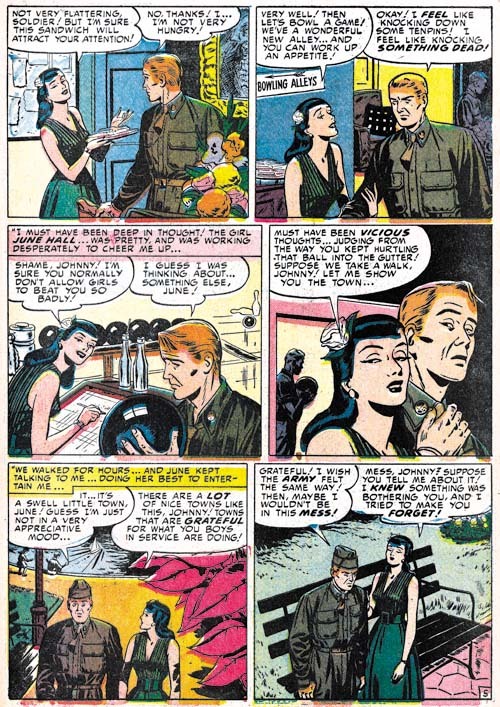 The last line of the soldier “you were wearing my ring and someone else’s heart” sounds so like Kirby to me. Even the whole concept of a person entering the room to verbally disrupt the proceedings is one typically found in Jack’s art. 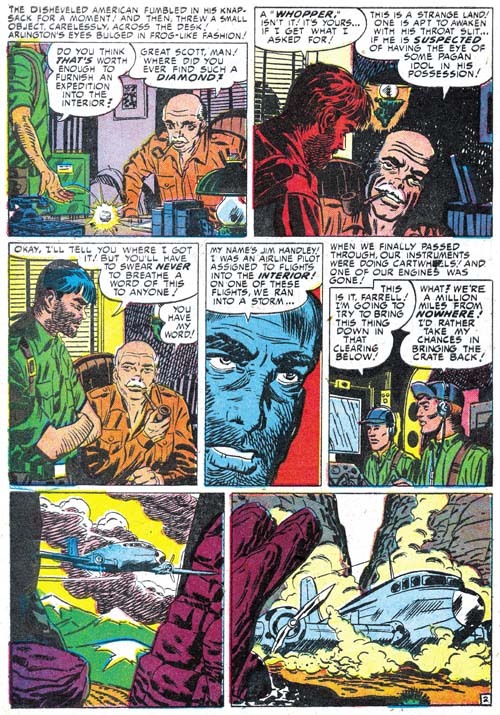 Unusually Kirby did not alter Mort Meskin’s art as he sometimes did with other artists. However I suspect that is what happened here. The composition suggests that there always was a figure on the right side of the splash. Perhaps Kirby was not happy with it, removed the old figure and added a layout and text for the balloon. With other artists Kirby would just have proceeded to draw and ink the figure but since Meskin worked in the studio Jack just left it to Mort to finish it up. As I have previously mentioned, Meskin has seemed to pick up the use of tall narrow panels for some pages in a story. I find the above page from “Gentlemen Prefer Ladies” particularly effective both in how well Mort uses the narrow panels and for the cinematic approach to presenting the story. Mort likes to provide the man of his stories with a pipe as a suggestion of their sophistication. I love how this pipe is prominently displayed even in fight scenes. Despite the fact that Meskin was providing more pages of art then anyone else, it was Bill Draut that was used for those lead stories not done by Kirby during this period. Draut was not as good an artist as Kirby (who was?) but he still did an excellent job on the confessional splashes. The one for “Can’t Help Wanting That Man” provides a complete story. 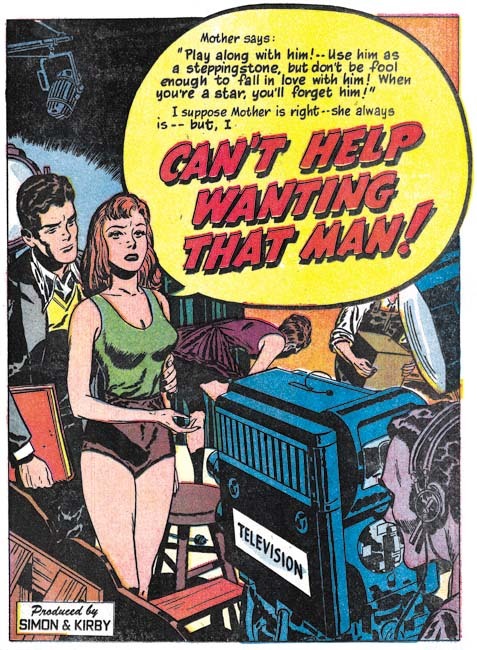 The struggling starlet torn between ambition and desire is venting her dilemma on a busy television studio while here love interests looks on. It is everything a splash should be, particularly for the all important first story of the comic. John Prentice had his own way of graphically telling a story and I provide an example above. The way he works up to the dramatic close-up in the last panel is quite good. I do have some qualms about panel 4. The simple hatching used for the sky unfortunately inappropriately suggests rain. It is not Prentice’s fault but the handkerchief that the lady holds has suddenly become the same color as the man’s shirt making it all a bit more confusing then it really would have been. Note the way the brickwork is handled in the last panel. The use of scattered groups of black bricks done in rough brushwork is often seen in Bill Draut’s work. George Roussos drew 6 features during this period and except for one they were all 1 or 2 page long. It is easy to see why; Roussos really was not that great of a romance artist, at least at this time. 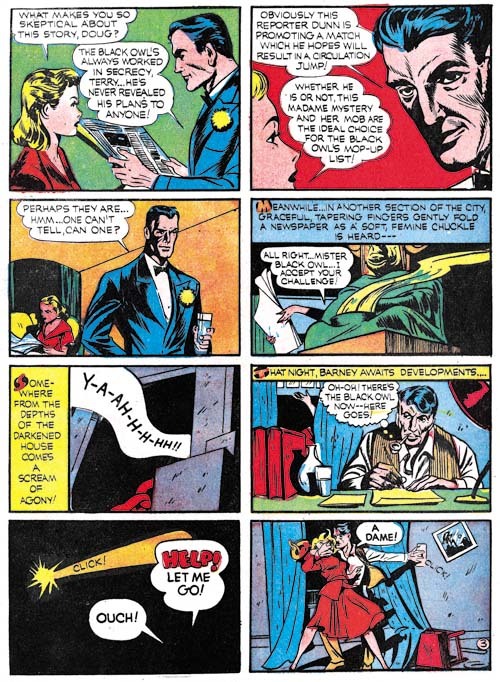 Like most of the comic book industry at that time, Simon and Kirby did not normally provide credits for the artists that worked for on their productions. However they always allowed, perhaps even encouraged, artists to sign their work. So I always pay attention to the signatures because they provide the means to learn how to identify the various artists. The signature for “The Great Indoors” is a bit hard to make out but I thought it might have said Persius. It was the only story by Persius in my database and I could never uncover any further information or work by that artist. That is how it stood for a long time but my work for The Art of Romance has really tuned me in to the style used by George Roussos and when I saw the last panel of the splash page I immediately recognized it as his work. There are some parts, such as the man in the splash panel, that look like Mort Meskin’s style but initially I just attributed that to the large influence Meskin had on Roussos. When I closely looked at the signature again, I thought it actually read Roussos. Hey what can I say? Both the signature and the printing were poor. Going through the story I came across page 3 and saw the tall narrow panels. This is not a panel layout that I have seen Roussos use but it is one that Mort Meskin often turned to (see above). Then it all made sense. “The Great Indoors” was laid out by Meskin and finished and inked by Roussos. I have seen Jack Kirby do this with some less talented artists but this is the first example I have found of Meskin doing it. Roussos was one of Meskin’s inkers for work done previously at DC. I often find him listed as the inker for Meskin’s S&K work as well but I have not seen any evidence of that. Further Joe Simon has told me that Meskin inked his own work. “The Great Indoors” gives an indication of what Roussos inking Meskin have looked like at this time. There is one artist I have not been able to identify but he only did a single piece, “Three Day Pass”. I find some resemblance to the work by Al Eadeh (Art of Romance, Chapters 5 and Chapter 7). Eadeh worked for Simon and Kirby back in 1949 and if “Three Day Pass” is by Al then his work has evolved a bit. Unfortunately I have no interim Eadeh pieces to compare it with, so for now I am just leaving it as unidentified. When Joe Simon was young he tried his hand in a number of different types of art work; political cartoons, sport illustration, portraits, story illustration, and oh yeah comic books. 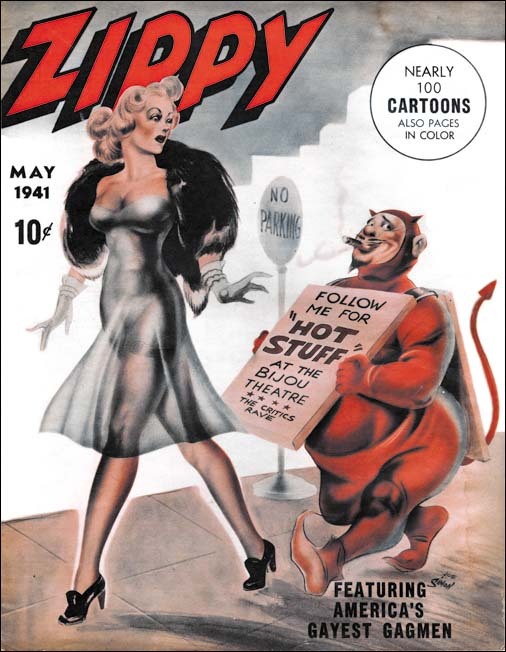 One art media Joe did not do was adult humor, that is except for the cover of Zippy #1. Here Joe provided a lecherous short man wearing a devil’s costume and an advertisement sign for Hot Stuff trailing a tall beautiful woman with a rather revealing dress. No punch line, just a visual gag that is more naughty then humorous. Joe executed the art with an air brush, a tool that he had become an expert at when he was a newspaper staff artist. Dunellen is a small community in central New Jersey that in 2000 had a population of 6823. It might seem to be an odd address for a publisher but in 1941 the town’s principal industries were R. Hoe Printing Press (manufacturer of letter presses) and Color Printing Company (owned by the W. F. Hall Printing Company of Chicago which at one time was the largest printing company in the world). Color Printing was almost certainly the printer of Zippy #1. The subject matter is not the only thing that makes Joe’s work for Zippy unusual, the date does as well. Simon and Kirby’s Captain America was released to great success just two months before Zippy #1. Even before Captain America had made it to the newsstands, Joe and Jack had discontinued moonlighting for other publishers. Simon and Kirby must have felt they had a hit and with the promise of a share in the profits decided to concentrate their efforts to Timely alone. So why at this point would Joe decide to venture out into adult humor? The answer is that actually Joe was not moonlighting when doing Zippy. A Google search found Manvis listed as a subsidiary of Magazine Management Company and publisher of the pulp Western Short Stories, and the comics Navy Combat and Sub-Mariner. Magazine Management was the name often used by Martin Goodman for his company that today is commonly referred to as Timely. Goodman would want to avoid legal hassles that Zippy might generate and the use of Manvis Distributors in the indicia could be nothing more then a smoke screen. 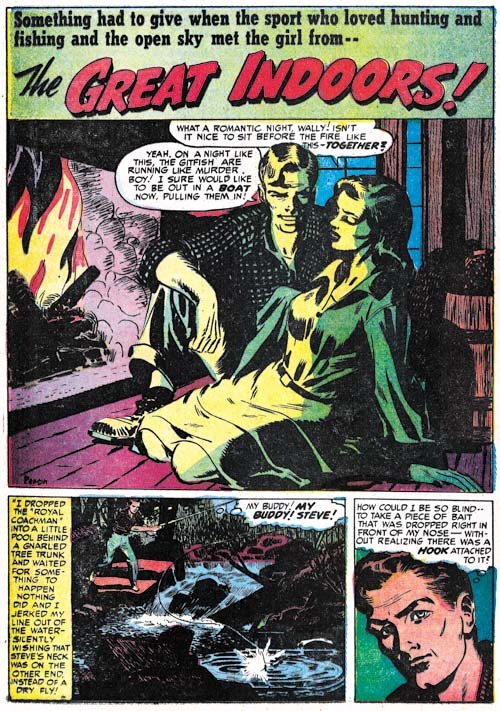 Joe Simon was Timely’s first comic book editor and his handiwork can be found not just in the comics but the pulps and crime magazines as well. Joe would have been a logical choice to oversee Zippy and he had used the opportunity to put his own work on the cover. 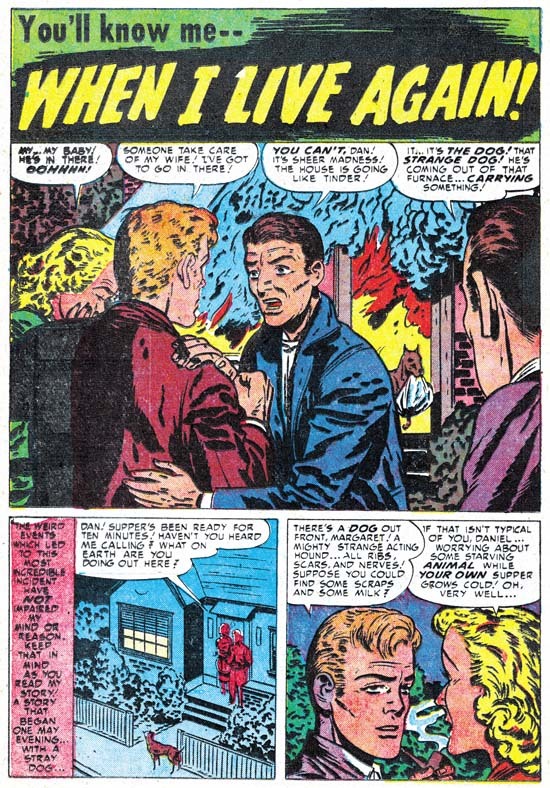 Many years later, 1957 to be precise, Warren Kramer would create a little devil for Harvey Comics that was also called Hot Stuff. Just a coincidence? Perhaps, but in that year Joe Simon was also working for Harvey and he could have shown Harvey and Kramer one of the copies of Zippy from his collection, copies that he still has today. If so it would not have been the only time that a Simon original had inspired the creation of a popular comic book feature. 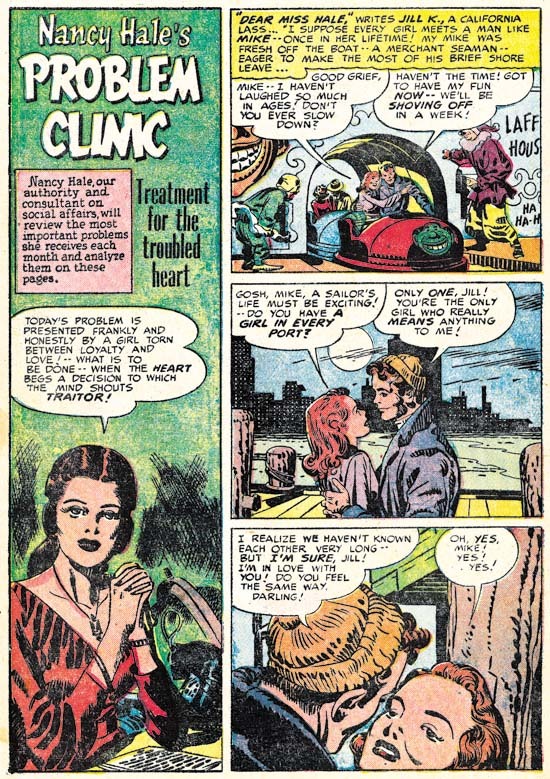 During the period covered in this chapter, along with the bimonthly Black Magic, Simon and Kirby were producing two monthly romance titles (Young Romance and Young Love). Not the largest work load for the prolific duo but apparently all the titles were doing well. 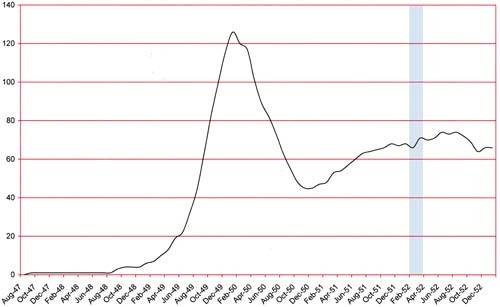 Since Simon and Kirby received a share of the profits, sales volume was more important then the number of titles produced. 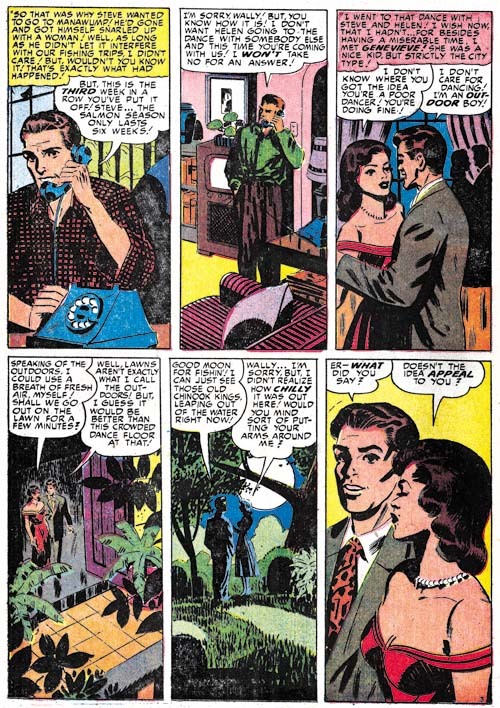 As was true with the concurrent romance titles (Chapter 17 of The Art of Romance), Jack Kirby was producing less then his normal amount of pages of art work. In BM #7 and #8, Jack would do the two covers and a single 8 page story. 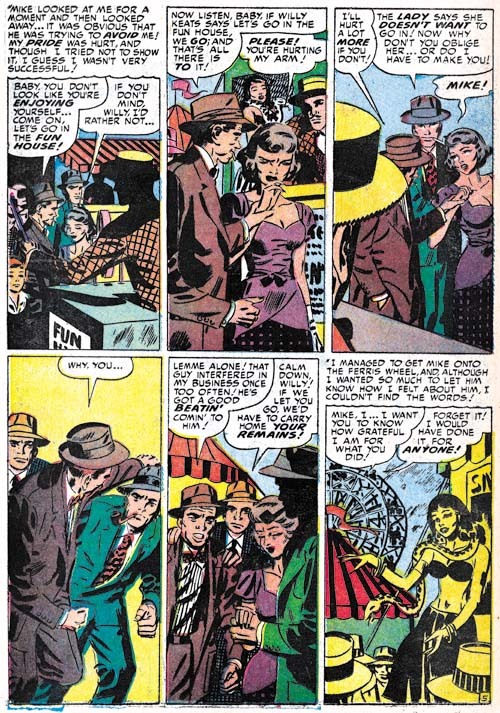 It was Mort Meskin who was the most prolific artist providing 23 pages for these two issues. Even John Prentice and Marvin Stein produced more pages then Kirby (both with 12 pages each). 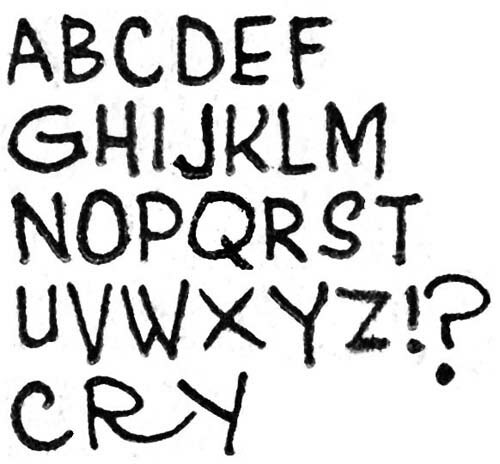 Bill Draut would provide a single 7 pages story. That was the complete artist line-up for BM #7 and #8; just the regular studio artists of that time. This is another of those chapters where I have been able to identify all the artists who worked on these issues. 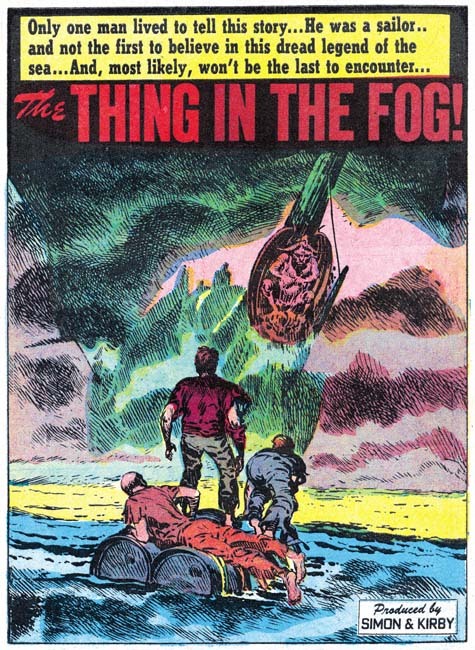 The full page splash for Jack Kirby’s single story, “The Thing in the Fog”, is quite unusual for the artist. Typically Kirby focuses on the human elements of a picture but here all we see are the backs of three individuals on a make shift raft. The center of attention is the approaching ship and even it is mostly lost in the fog with only the masthead distinctly delimitated. The depiction of fog would normally be expected to be billowing cloud shapes but instead the mists are rendered by a complex of strong crosshatching. The whole effect is one of eerie mystery and impending doom. It may be an unusual splash for Kirby but still one of his greater pieces of art. 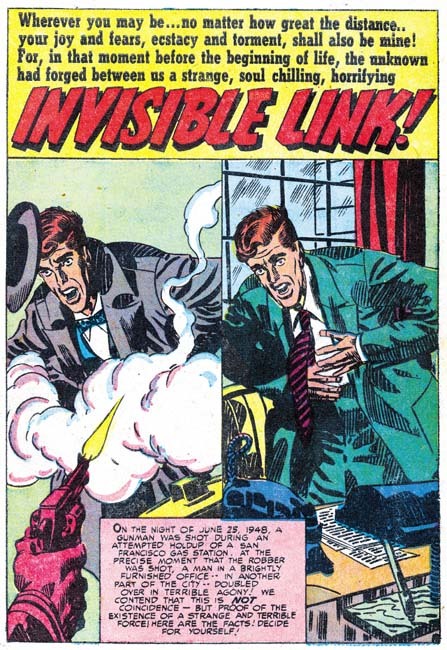 Meskin’s splash for “Invisible Link” consists of a repeated image although with different clothing and surroundings. Today the artist would probably simply draw one, make a copy and work on the copy to produce the second image. But at this time there were no cheap copiers and so a stat would have to be made. This not only meant added costs but added delay as well. Instead Mort simply redrew the figure. By quickly going back and forth between the two images you can verify the differences between the mouth, nose and other details. The use of a double image is a simple device but one that captures the essence of the story. 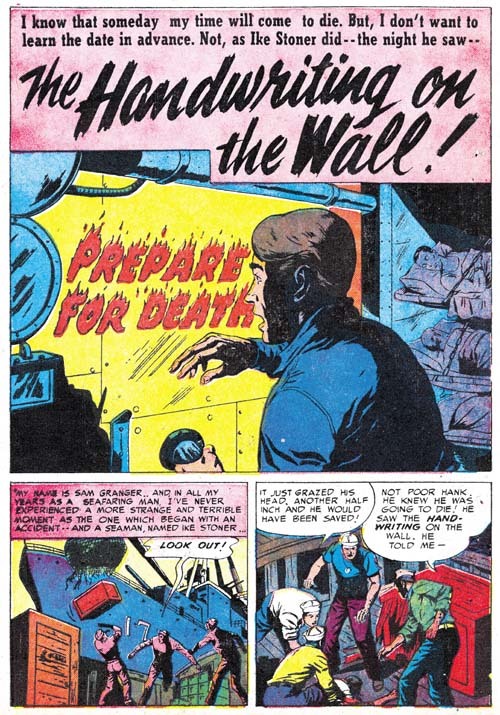 I have previously remarked that Meskin would sometimes adopt the tall narrow panels that earlier were used by Leonard Starr. In Mort’s case this typically meant dividing the page into two rows each with 3 panels. Above I provide a page with a slightly different approach. The height of the bottom row has been reduced giving even more vertical dimension to the narrow panels of the top row. To make up for the loss of height, the bottom row only has two panels. 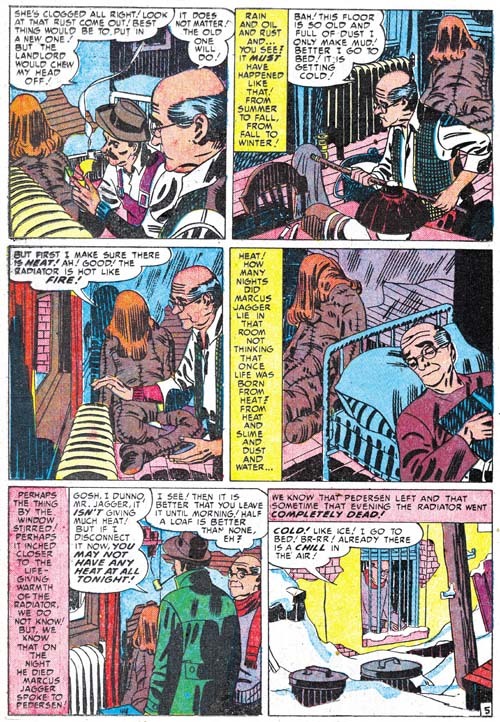 These tall narrow panel layouts are normally not found in the works by Jack Kirby during this period and that is another of the recurring indications that Kirby was not providing layouts to Mort as some people have claimed. Further it suggests that whatever script was provided to Meskin it either did not completely detail out the art on the page, or if it did Mort felt free to deviate from the directions. 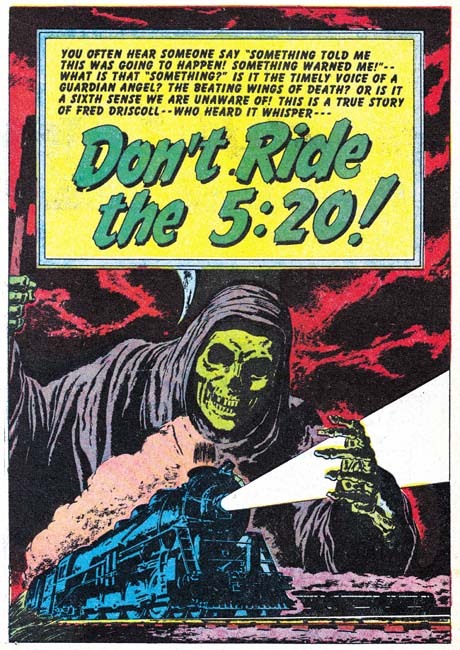 A skeletal cloaked figure of death looms over a speeding train in this full page splash by Bill Draut. Of course none of these elements are found among Bill’s romance art so it is by depictions of people in the story that allows this work to be safely attributed to him. The detailing of the drawing of the train indicates it was based on a photographic image. But the sharpness, so untypical for Draut, suggests that rather being swiped from a photograph that perhaps the picture was literally glued down on the board and then inked over to provide the desired effect. If true this would be an unusual occurrence at this time although years later Simon would often build up a cover using stats. 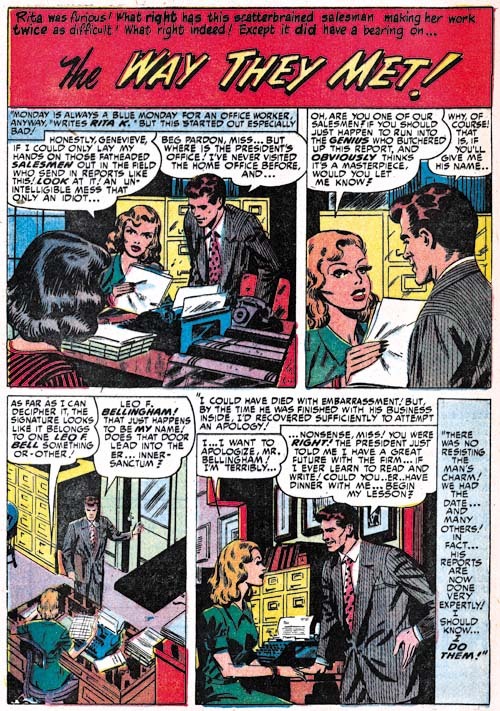 It is not unusual for Jack Kirby to assume the role of art editor and make alterations to the work submitted by artists employed by the studio. Normally this is for less talented artists and I do not recall ever seeing Jack fix up the work of Bill Draut or Mort Meskin. 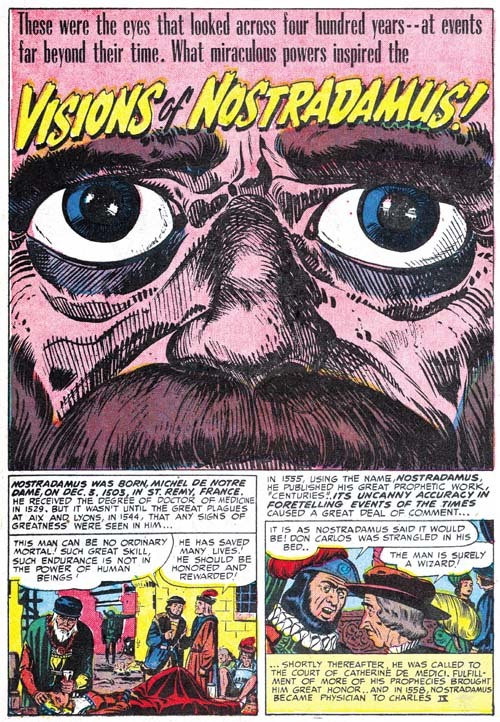 I consider John Prentice as in the same talented class with Draut and Meskin which is why I am surprised to see Kirby art editor’s hand at work in some of art submitted by Prentice when he first appeared in Simon and Kirby productions. 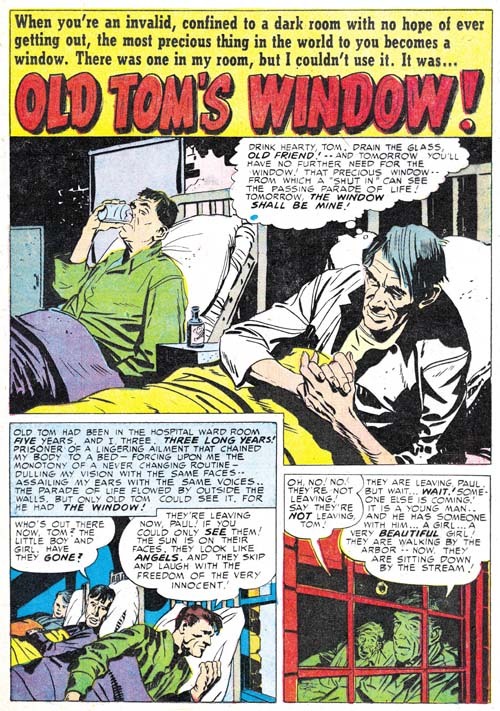 Compare the first story panel for “Old Tom’s Window with the rest of the page and you will note subtle but important differences. The figures in panel one are simpler and lack the craggy feel found in the splash and the second panel and which is typical of Prentice’s depictions of men. Also observe the difference in brush techniques. Those in the first story panel include picket fence crosshatching, drop strings and abstract arch shadows (see my Inking Glossary for explanations of these terms) that are typical of the Studio Style inking. The brush work is blunt but nuanced and was almost certainly done by Kirby. The inking on the rest of the page lacks these elements and is typical of Prentice’s approach. It is hard for me to understand why Jack felt compelled to work on this panel since the depiction of the men in hospital beds is really not that different from those done by Prentice on the rest of the page. Perhaps it was not so much Jack correcting John as providing him with guidance about how to do the story. If that was true it was with this single panel as the rest of the story is laid out in Prentice’s characterizing manner. By this time as I mentioned in The Art of Romance (chapter 16), Marvin Stein’s art was beginning to show some significant improvements from his earlier more crude style but has not quite reached his more mature style. I credit much of Stein’s improvement to his close study of Kirby’s art either through close observation while working in the same studio or perhaps by actually inking Jack’s work (although I have not yet verified Stein’s inking of Kirby at this early date). Marvin’s inking has particularly improved from his early version to this one. Normally I prefer to present a splash, but in the case of “No One Human” it is difficult to recognize Stein’s hand in the first page. Instead I show page 2 where the man in panel 3 is very close to Stein’s mature art style. 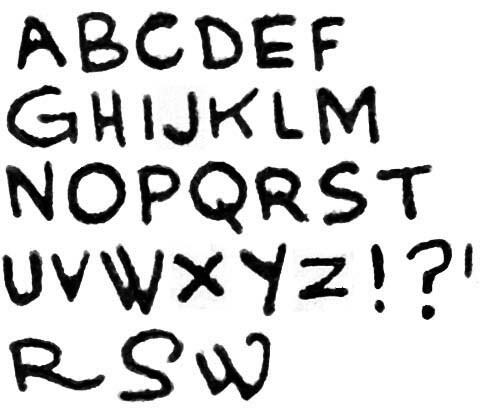 Note Marvin’s frequent angular crosshatching. While this is not generally found in Stein’s work it plays a prominent part of this story but I have to admit I find it rather distracting. Also observe the vertically oriented captions. Kirby would only occasionally use vertical captions so this is an indication that this story was not based on Kirby layouts. 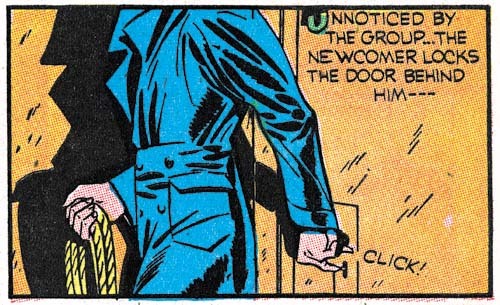 Interestingly vertical captions are often used by Mort Meskin who also occasionally uses similar angular crosshatching. I find it hard to believe that Meskin would be supplying Stein with layouts and even harder to accept that Mort would be inking Marvin’s pencils so I suspect that Stein was also carefully studying Meskin’s work as well. 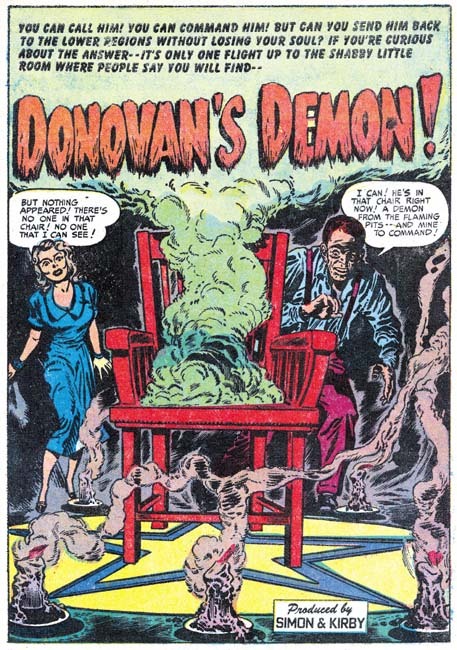 I have discussed the splash for “Donovan’s Demons” in the past (Summoning Demons). The only modifications of my previous views is that I know come to credit the artist for the story as Marvin Stein. But to quickly review, while the man appears to have been drawn and inked by Stein, the woman is clearly the work of Jack Kirby. Both are background elements with the most important part of the splash being the chair, candles and star pattern on the floor. The candles are good matches for those done by Kirby found elsewhere. Chairs do not normally play such a prominent part in Kirby’s art so it is difficult to make a comparison. However the perspective on the chair is so well done and since this sort of dramatic perspective played such an important art I believe Jack did the chair as well. It is not that unusual to find a Kirby figure in a splash otherwise done by another studio artist but it is odd to see a single figure by another artist in a splash otherwise done by Kirby. Perhaps this was done so that there would be some continuity between the splash and the rest of the story art.